Saratoga Springs, NY – Local board certified plastic surgeon, Steven Yarinsky, MD at Saratoga Springs Plastic Surgery, PC announces the arrival of the ZERONA®, the only non-invasive, body contouring, low-level laser treatment, to its practice, making him one of the first physicians to offer the ZERONA® in the Capital District, Upstate New York Region. During clinical trials, the ZERONA® has been scientifically proven to result in an average of 3.6 inches lost from patients’ waist, hips and thighs. ZERONA® has been FDA approved for both safety and effectiveness. Unlike invasive weight loss surgery, ZERONA® is a revolutionary method that is applied externally without the dangers associated with surgery or other non-invasive devices which rely on heating the tissue. The new technology has been proven to reduce inches from target areas such as the tummy, back, hips, thighs, buttocks, chin, neck and arms; contour and reshape the body; and tighten and tone loose skin. “I added ZERONA® to our practice to offer those people who don’t have the time available to recuperate from liposuction body contouring and those patients who are not candidates for liposuction to reduce inches in their waistlines and thighs,” says Dr. Yarinsky. 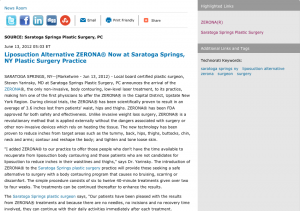 The introduction of ZERONA® to the Saratoga Springs plastic surgery practice will provide those seeking a safe alternative to surgery with a body contouring program that causes no bruising, scarring or discomfort. The simple procedure consists of six to twelve 40-minute treatments given over two to four weeks. The treatments can be continued thereafter to enhance the results. The Saratoga Springs plastic surgeon says, “Our patients have been pleased with the results from ZERONA® treatments and because there are no needles, no incisions and no recovery time involved, they can continue with their daily activities immediately after each treatment. ZERONA® is an excellent option for patients who want to fit their clothing better but do not want to experience the downtime, health risks or pain associated with more invasive procedures for body contouring.” ZERONA® laser light is applied externally, directed toward the skin in the areas to be treated. In contrast to liposuction, there is no surgery, anesthesia, or discomfort involved with Zerona treatment. Liposuction is designed for reducing diet and exercise resistant fat deposits in people who are at or near their ideal body weight for their height. However, ZERONA® can be used to effectively treat these as well as larger patients who are not good liposuction candidates. ZERONA® uses a patented and clinically proven low-level laser technology developed by Erchonia, the global leader in low-level laser healthcare applications. The results were proven effective through a double-blind, randomized, multi-site, and placebo-controlled study. Clinical studies demonstrated that the ZERONA® low-level laser targets adipose tissue (fat storing cells) creating a chemical signal which stimulates the fat cells to liquefy the stored triglycerides within the cells breaking them down into free fatty acids, glycerol and water. A small pore is then naturally created in the protective membrane of the fat cells enabling the contents to seep out of the cells to be absorbed by the lymphatic system. The excess fat is then passed out of the body during its normal course of detoxification which results in millions of fat cells becoming smaller as inches are reduced. “ZERONA is the leading technology for body contouring without surgery,” said Michael Browning, Senior Vice President of Business Development and Marketing of SBMI. “We are pleased to bring such a superior product to highly-respected doctors such as Dr. Yarinsky who can now offer ZERONA as a perfect solution for those who want to jump start or maintain a healthier and slimmer lifestyle in the Capital District and Albany areas.” By helping his patients achieve a more toned physique, Dr. Yarinsky says he hopes to help patients restore their full confidence in their bodies, and live a happier, healthier life. After completing medical school at SUNY Upstate Medical Center, Syracuse, Dr. Steven Yarinsky completed his general surgery residency at Ohio State University, followed by two years of training in Cosmetic and Reconstructive Surgery at the Medical College of Ohio. He remains dedicated to continuing education and the latest technological advancements in plastic surgery. Dr. Yarinsky is an active member in the American Society for Aesthetic Plastic Surgery, the American Society of Plastic Surgeons, and the Saratoga County Medical Society. Saratoga Springs Plastic Surgery, PC is located at 7 Wells St. 3rd Floor, Saratoga Springs, NY 12866, and can be reached at (888) 884-4448 or (518) 290-1919. Dr. Yarinsky and his team can also be found online at www.yarinsky.com and their Saratoga Springs Facebook page.